Peridot is the August birthstone. This green gemstone is believed to help with nightmares, bring prosperity, fertility and healing. Peridot was once called the "gem of the sun" in ancient times. Peridot is actually a variety of the mineral olivine. Peridot is the only gem quality variety of this mineral. This gem is hard enough to be suitable for every day wear. Good quality peridot looks like a delicious green apple. The best peridot comes from Italy and has a rich olive color. Peridot from America is a light yellow green color. If you went into space you could mine peridot from meteorites as some have been found with peridot crystals. The word peridot has a few sources. The Arabic word fariadat means gem, and the Greek word peridona means giving plenty. Peridot is a unique gem in that it is formed in volcanic fire. The best source of peridot is in America on the San Carlos Native American Reservation. Peridot was once known as chrysolite in ancient times. Peridot comes in only one color, green. This is unusual as most gemstones come in at least a few colors. Top quality peridot should have no inclusions even under magnification. The birthstones that are set aside for the month of August represent a nice range of choices that can be implemented into your life in a number of ways. Between the traditional, modern, and alternate listings that most people choose as the chief references for birthstones, people born during August can choose from a collection of five different stones. This amount of variety provides a lot of leeway in coming up with ways to make use of your birthstone. The selections for August birthstones are not always as well known as other stones, but they do provide a nice mix of options. From the modern listing of birthstone options, August can enjoy the peridot. The traditional listing for August includes two stones: sardonyx and carnelian. One way to enjoy your birthstones is to go with the more predictable pieces of jewelry. This would include incorporating the stones into such items as earrings, necklaces, pendants, and bracelets. In order to make these typical applications a little more interesting, mix things up a little by using two or more of the birthstones that show up on one list or the other. This will help to add visual interest to the piece, and is more likely to be appropriate for wear in more than one setting. An alternative recommended listing to the modern and traditional options provides the choices of the sapphire, aventurine, and sardonyx. From this listing of beautiful stones, it is possible to come up with all sorts of interesting pieces that celebrate your birth month. Another idea is to think about including examples of one or more of your August birthstones into elements in your home. This can be done with some very subtle touches, such as using them in the design for a picture frame, a figurine, or even by having the stones used as embellishment on some item around the house, such as tiebacks to drapery panels. Finding little ways to enhance your space with reminders of your birthday will not only give your home a more personal touch. They will also give you little touches that remind you of who you are and what your family means to you. In 1912 the American National Association of Jewelers named the Peridot (pronounced pair i dot or pair i doe) as the august birthstone. In addition to this honor the Peridot is also given as the 16th anniversary gem. 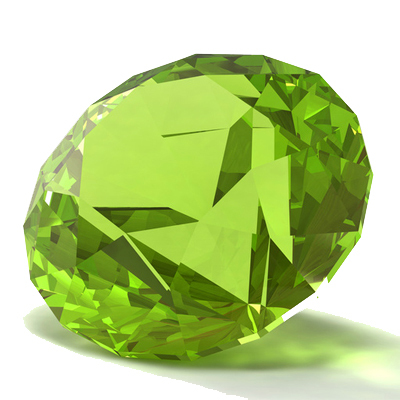 A beautiful green to yellow-green in color, the peridot is often mistake for an emerald. In fact, legend has it that Queen Cleopatra preferred Peridot over other gems and that some of her "Emeralds" may have been Peridot. Emeralds, though, don't have the yellow tint and tend to be a darker green. Peridot has been around for awhile... there are records placing it in Egypt over 3,000 years ago. The Romans loved the green sparkle (which doesn't change with the light) and they named it the evening emerald. It was rediscovered in the 1990s and became the sensation of the gem tradeshows. A huge find was made in Pakistan, in the mountains, at just over 13,000 feet! Despite the harsh conditions of the mountains and the mines it is a rich enough find to satisfy the world's demand for the august birthstone. The Peridot found in this mine are also unusually large and clear. In fact, their quality is such that they are referred to as Kashmir Peridot. Some of the one-off fancy cuts of these peridots have been over 100 carats in weight. Legend has it that most gemstones have some sort of magical power (and crystal healers use these powers) associated with them. Because of this people will work peridot and the other birthstones into birthstone charms, pendants, rings, and all sorts of other jewelry. What better way to get the full benefits of your birthstone than by wearing it? Healing Power: Peridot brings the energies from in the aura to the physical body. This is useful after energy work -- however, one needs to be certain that they are bringing in the new energy -- not the stuff they are trying to purge. Use with caution. Another legend is that pirates favored the gem to protect them from evil (!) and that when set with gold Peridot would help protect against the terrors of the night. The august birthstone makes an excellent gift. Whether as a Catholic gift or for teen jewelry and children's jewelry, and it's an excellent gift for the grandparents, and so on. ultrasonic jewelry cleaners are not recommended with this gem.